There are so many ways to drop seeds. There are many ways to practice. 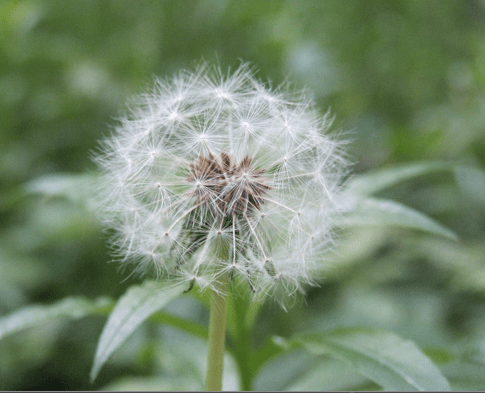 BTW dandelions aren’t necessarily considered weeds in Japan. If you’ve been reading the blog for a while, you may know that I have hundreds of dollars in learning how to play guitar books. I’ve been accumulating them for years, but not really using them. I’ve also barely played guitar and I’ve stayed a beginner. But I keep reading (and now writing) about the power of five minutes of daily practice. (Thank you Khatzumoto, The Little Book of Talent, Talent is Overrated, Steve Chandler. Love you guys. Muahhhh!) Hey, what’s five minutes? Even if I am tired, I can keep the mental wheels a little more greased and not lose the physical memory that’s important for playing an instrument. But I still have those piles of guitar books. I decided that I would go ahead and spend some time with them but just pulverize them into small digestible bits and see what happens. Each morning, I find a two minute chunk of knowledge and record it into my samurai mind notebook. (It’s just a notebook but it sounds cooler, doesn’t it?) I decided to start with Theory for the Contemporary Guitarist because it seems like something that I could study when I am away from the guitar. I am studying this slooooooowly. But my philosophy is that by doing it a little digestible chunk, one little seed, at a time, I am doing a heck of a lot more than just letting the books gather dust. Maybe in fifty years, I will get to The Advancing Guitarist. For example, from March 14 to April 9th I studied one diagram of the fretboard and how it is notated. Each day, I took one fret and wrote down either the notes or how they are notated musically. Because it is in my notebook, and I use spaced repetition, I am actually going back to those facts repeatedly. But push needs to come to play. After I go home and pick up the guitar and target a skill or tune for five or more minutes, I find that there is a guitar around my neck. I give myself time to play, explore, and just fart around on the guitar. Sometimes I use the new knowledge, sometimes I don’t. But there is a little less dust on my guitar and guitar books. Drop the seeds, plant the seeds, and play.